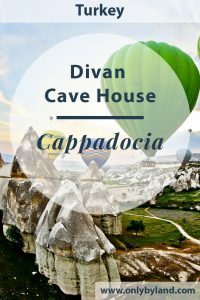 Divan Cave House offers the complete package for those visiting Cappadocia. 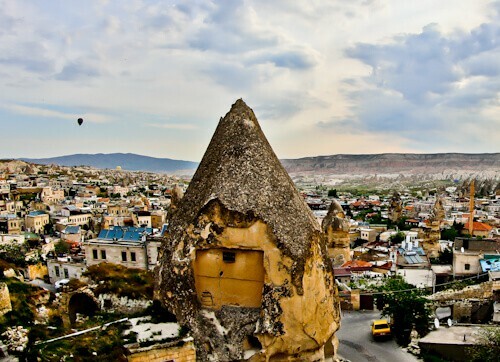 Everything you’ve read about Cappadocia, as well as the pictures you’ve seen can be experienced at the hotel. 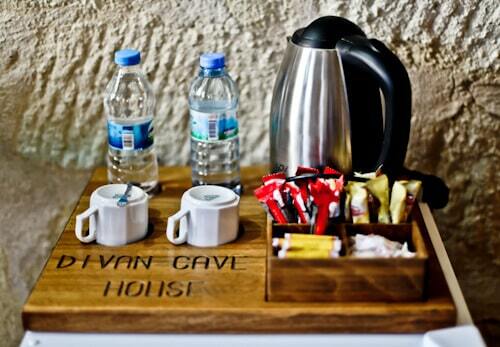 Visit the Divan Cave House website for the best room rates. For the latest events and pictures check the Facebook and Instagram feeds. For quick communication I recommend contacting the hotel through Facebook Messenger. Cappadocia is famous for its unique landscape. A prominent feature of the landscape are the rocks which resemble chimneys, in fact they are known as fairy chimneys. It’s possible to stay inside some of these chimney shaped rocks in a chimney room. 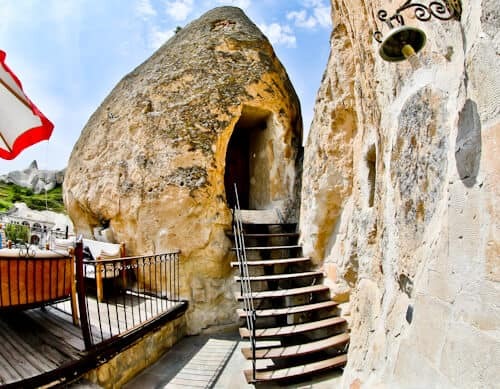 If you’re looking to enhance your Cappadocia hotels experience I recommend booking a fairy chimney room. A fairy chimney room is a unique experience but they are not the most spacious of rooms. If you like your hotel room to have a lot of space then I recommend a cave room. 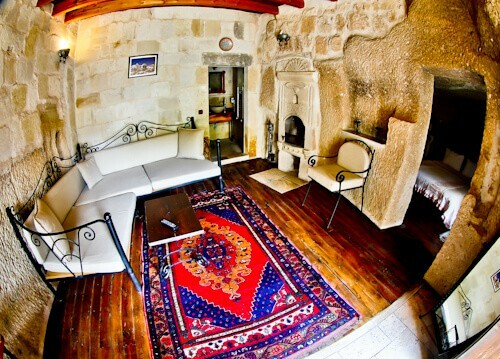 Each cave room is uniquely designed and furnished with traditional Turkish products. Although you’re in a cave, you still have access to fast WiFi as well as flat screen TV with cable channels. In addition, there is a fireplace for those winter nights. 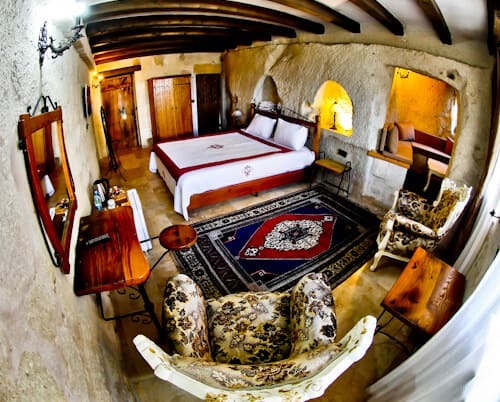 The largest rooms at the Divan Cave House are the cave suites. Staying in a suite makes you feel like you’re living in a cave house! All rooms are en suite and provide more than sufficient bathroom amenities. Several mini bottles of shampoo and shower gel are provided which means you won’t run out! Additionally, the important hairdryers are provided! Whichever room you choose at the Divan Cave House you’ll have a complimentary minibar, not many Cappadocia hotels can boast a free minibar! The minibar consists of water and coffee. Coffee is very important, especially if you’re waking up early for a hot air balloon flight. The water comes in useful for the hot summer days, or of course to boil for the coffee. Staff at reception will be more than happy to replace the items for you. It’s difficult to say what is best about the breakfast, the food or the view? 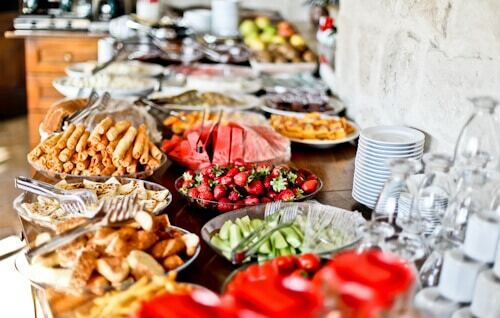 The buffet consists of fresh fruits, salad, crepes, french fries, freshly baked breads and cereals. In addition there are a few Turkish options which you can try, giving you your first chance to taste the local food. As well as the buffet, you may order eggs as you like them. To drink you may choose tea, coffee, fruit juices or water. Something special about this buffet is that bread baskets are provided so you can take the freshly baked bread to your table. It’s a nice little touch to have a basket of bread to share with your family at breakfast. The view from the hotel terrace is incredible, additionally this is where you enjoy breakfast from. If you get up at sunrise you can also view the hot air balloons flying over Goreme. The terrace makes a good place to take your Instagram photos with the hot air balloons of Cappadocia in the background. A must when you visit Cappadocia is to take a hot air balloon ride. Staff at the hotel will explain the prices of the rides and the different companies available. 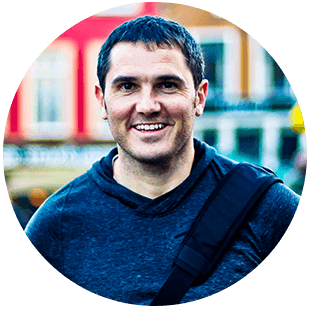 They’ll make sure you choose the right hot air balloon ride for your budget, in addition they’ll explain what to expect from your ride. Most importantly they’ll arrange a free pick up from the hotel to the hot air balloon launch site as well as the important wake up call! 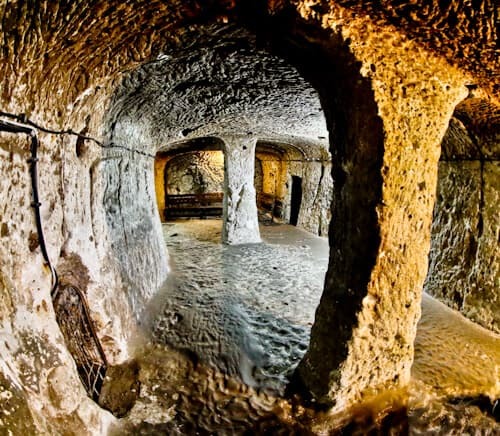 The second most popular attraction in Cappadocia is the underground city. You can arrange a tour to the underground city with the hotel. 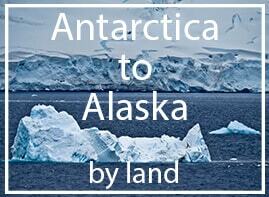 As with the hot air balloon ride, you’ll be conveniently picked up from the hotel. 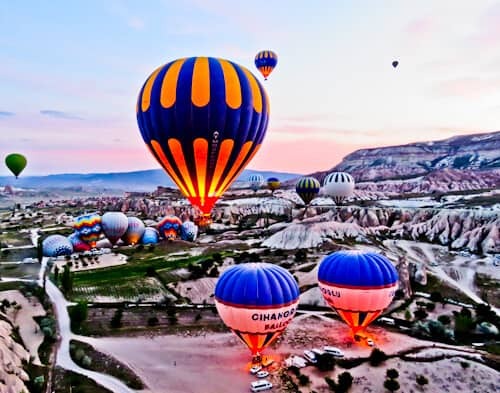 If you want to squeeze a lot into one day, you can take a hot air balloon ride at sunrise and visit the underground city later in the day. I recommend contacting the hotel directly to book your room, as well as to book and guarantee your space on a hot air balloon ride. In addition if you like a particular room I’ve mentioned above you could request that one.